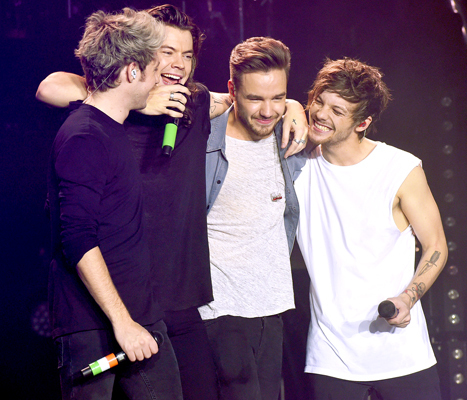 One Direction Fans React to Boy Band’s Last Show Before 2016 Hiatus: Watch! It’s not a goodbye — it’s just a see you later! One Direction gave a rousing, emotional performance in Sheffield, England, on Saturday, Oct. 31, the band’s last concert before an extended hiatus into 2016 — and there wasn’t a dry eye in the house! The four boy banders — Liam Payne, Louis Tomlinson, Harry Styles, and Niall Horan — gave it their all with their chart-topping hits for the show, which closed out their On the Road tour. PHOTOS: Biggest boy bands of all time! The four shared hugs onstage, boogied down in a conga line while performing “Act My Age,” and serenaded their fans, who reciprocated with wild cheers. After the concert, Horan took to Twitter to share his sentiments about the group’s pre-hiatus performance. Addressing a fan who asked if the band would be returning for future shows, Horan was adamant in his response.